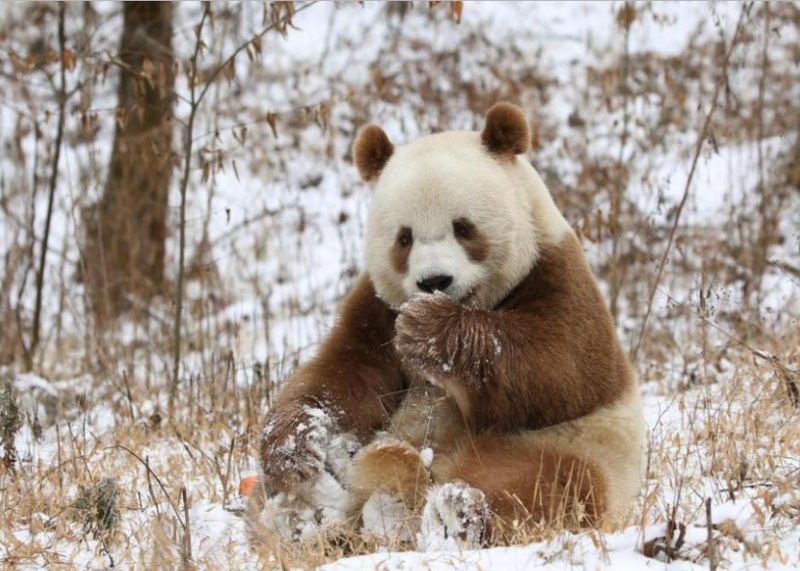 Qizai panda is the only brown panda in the World. The brown panda had a hard childhood. His Mather left him at 2 months old, and having to face bullying from other pandas growing up, now he is thriving and becoming a celebrity of the animal world. The name of the panda means “the seventh son”, he was found in Qingling Mountains in Central China. His mother was disappeared in the jungle, and it is supposed that she was black and white. The Qinling panda differs from the more familiar nominate subspecies by its smaller skull and dark brown and light brown fur, and its smaller overall size. Now scientists would like to solve the mystery of his brown fur, because they think that his brown and white coat is due to some genetic mutation. Despite his hard childhood, Qizai panda has turned into a fine specimen, and Chinese experts are planning to find him a mate. “Being able to observe and study the appearance of his child, researchers would get a step closer to solving brown fur’s mystery,” mentions boredpanda.com. The happy fact is that, Qizai panda has a chance to enjoy a good life at the Foping Panda Valley. He doesn’t force to steal food, beacause tha giant panda has a personal care-taker, who plans his life around her eating schedule. “The keeper wakes up at 6am and goes to sleep at midnight, just to make sure Qizai has a full bellly and is safe and sound”. The unique panda weighs more than 220 pounds and eats around 44 pounds of bamboo every day. “He is slower than the other pandas, but he is also cuter,” Qizai’s keeper told MailOnline, describing the bear as a ‘gentle, funny and adorable’ animal. Below watch the cutest and unique panda in the video! Previous Previous post: What Is the World’s Largest Crocodile?